Make the Curd: Set a strainer over a medium bowl; set aside. Stir lime juice, eggs, egg yolks, and sugar together in another medium bowl. Set bowl over a large saucepan of gently simmering water (do not allow bottom of bowl to touch water). Whisk until mixture has thickened, the whisk leaves a path when lifted from curd, and an instant-read thermometer registers 175°, about 15 minutes. Add butter to curd, one tablespoon. at a time, whisking to blend between additions. Strain curd into prepared bowl. Press plastic wrap directly onto surface of curd. Chill until cold, about 2 hours (NOTE: can be made 2 days ahead, refrigerated). (CK Edit – I skipped this next step, but feel free to include it if you would like): Sprinkle gelatin over 2 Tbsp. water in a small bowl; let stand until gelatin is soft, about 10 minutes. Using an electric mixer, beat cream until soft peaks form. Add gelatin mixture; continue beating cream until just before firm peaks form. Fold whipped cream into lime curd. Cover; chill. Make the Compote: Bring red wine, sugar, and 1/2 cup water to a simmer in a medium saucepan over high heat; reduce heat to medium and simmer until reduced to 1/2 cup, 20-25 minutes. Let cool. Add 3 cups berries; fold gently to coat. Make the Meringue: If toasting meringue in oven, preheat oven to 450°. Place egg whites in the bowl of a stand mixer fitted with a whisk attachment. Beat whites in mixer until soft peaks form. Gradually add the sugar and salt, continuing to beat until meringue is firm and glossy. Spoon meringue over lime curd, leaving a 1″ plain border, and sculpt decoratively. 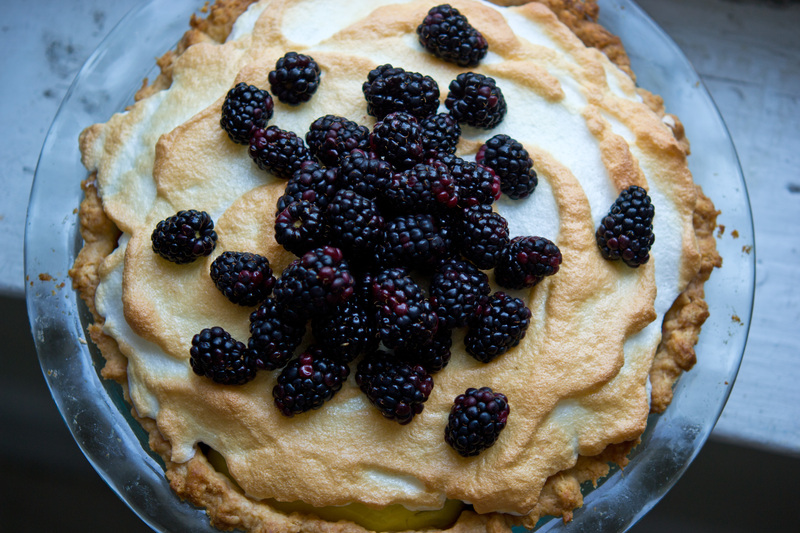 Bake pie until meringue is toasted in spots, 3-5 minutes (or use a kitchen torch to brown – keep a close eye on it or it will burn! ).